Zoning is a a system of land-use regulations. The word is derived from the practice of designating permitted uses of land based on mapped zones which separate one part of a community from another. Zoning regulations fall under the police power rights governments may exercise over real property. Theoretically, its primary purpose is to segregate uses that are thought to be incompatible; in practice, zoning is used as a permitting system to prevent new development from harming existing residents or businesses. Zoning is commonly controlled by local governments like the City of Nichols Hills. Zoning commonly includes regulation of the kinds of activities which will be acceptable on particular lots (such as open space, residential, agricultural, commercial or industrial), the densities at which those activities can be performed (from low-density housing such as single family homes to high-density such as high-rise apartment buildings), the height of buildings, the amount of space structures may occupy, the location of a building on the lot (setbacks), the proportions of the types of space on a lot (for example, how much landscaped space and how much paved space), and how much parking must be provided. 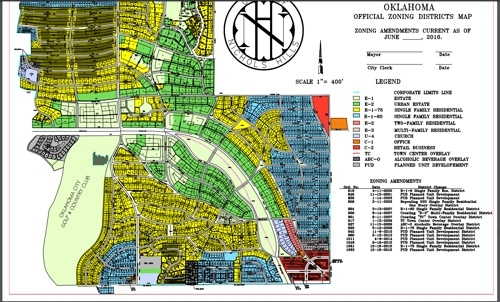 A copy of the zoning map for Nichols Hills is available for downloading below.